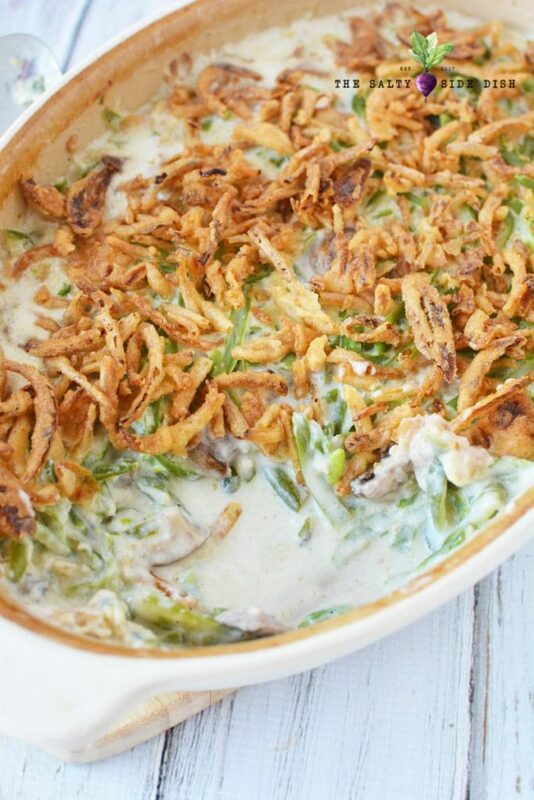 Green Bean Casserole is a classic side dish that appears on the table of everyone in the entire country each holiday season. But don’t let its simple ingredients fool you! Full of flavor and easy to customize with fresh mushrooms and roasted onions, some traditional recipes, like this one, are worth making year after year. Campbell’s, French’s, even Paula Dean and the good ole’ Pioneer woman all have a special take on green bean casserole. I love this side dish because its so simple and difficult to mess up, making it the perfect dish for the entire family to get involved in. Its savory and also heats up, making it a perfect left over that tastes the same the next day. 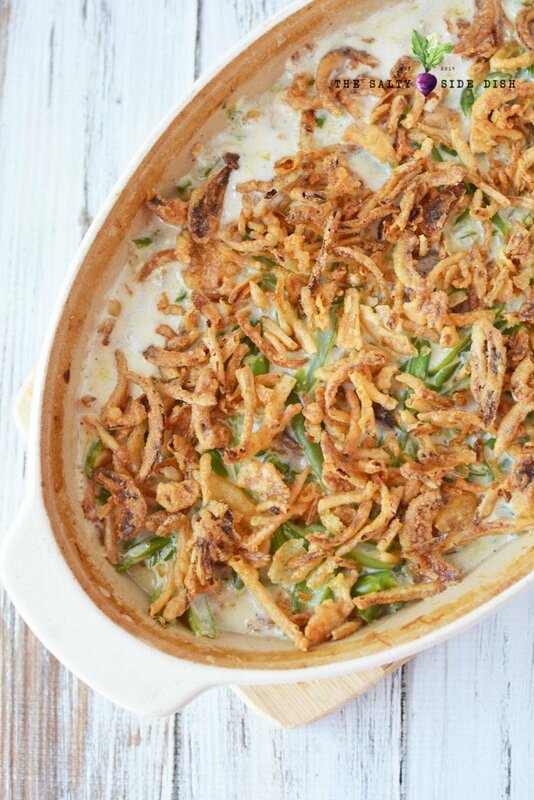 Now if you have never learned how to make green bean casserole, I am going to save you on delicious no fail classic recipe that is homemade. You wont need any canned soup making this casserole from scratch. Dietary: Heads up! 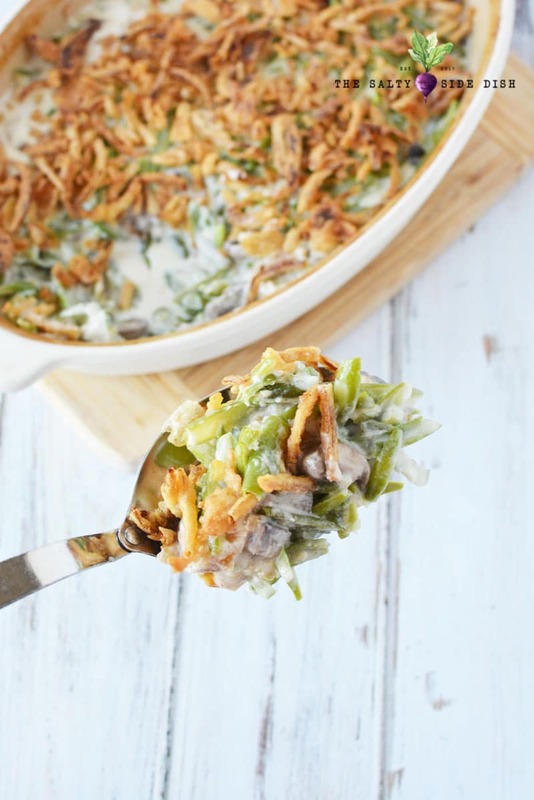 This green bean casserole is Low Carb! 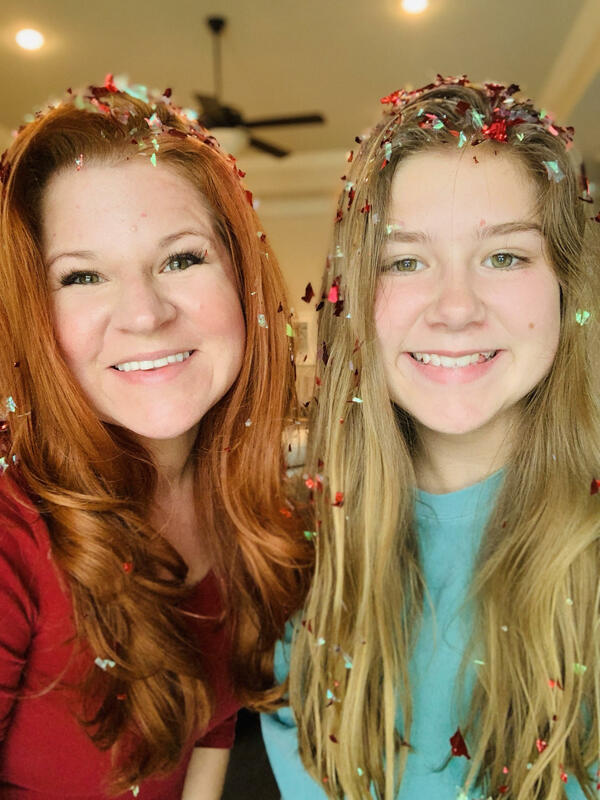 Remember by pinning this special PIN! If you are on a cell phone and this is hard to see, simply pinch and go closer. This casserole can easily be made with and without mushrooms. You could also use canned. You can use whole, cut frozen green beans as well. You could also technically just add the onions on the cast iron pan and toss it in to the oven. But I don’t think serving the skillet is that amazing, especially since you typically make this for holiday meals. 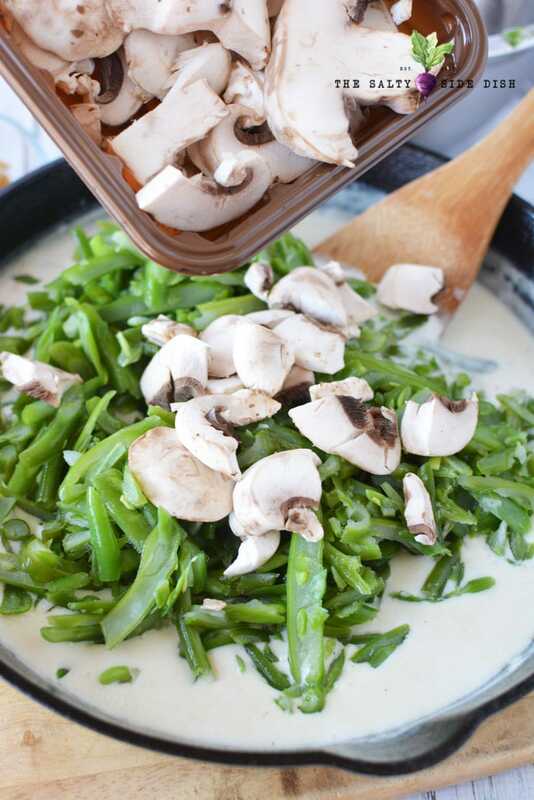 Need another amazing fresh green bean dish? You def have to try these Southern Style Green Beans, made with bacon and are am-ma-zing. Preheat oven to 400 and grease a casserole dish . Set aside. 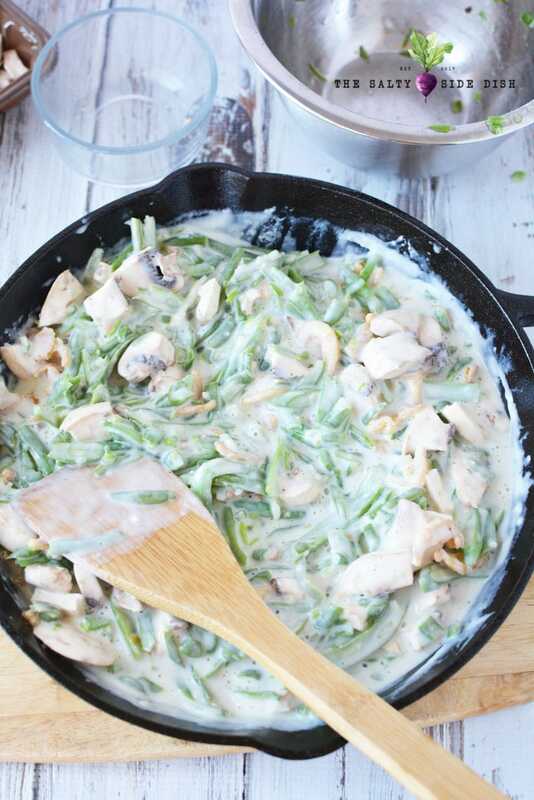 It’s totally easy to make green bean casserole with cream of onion or cream of mushroom soup but its also totally unnecessary! No need to run to the store to see what you have on hand when you can combine delicious fresh (or frozen) green beans in your own marinade of sauce this season. 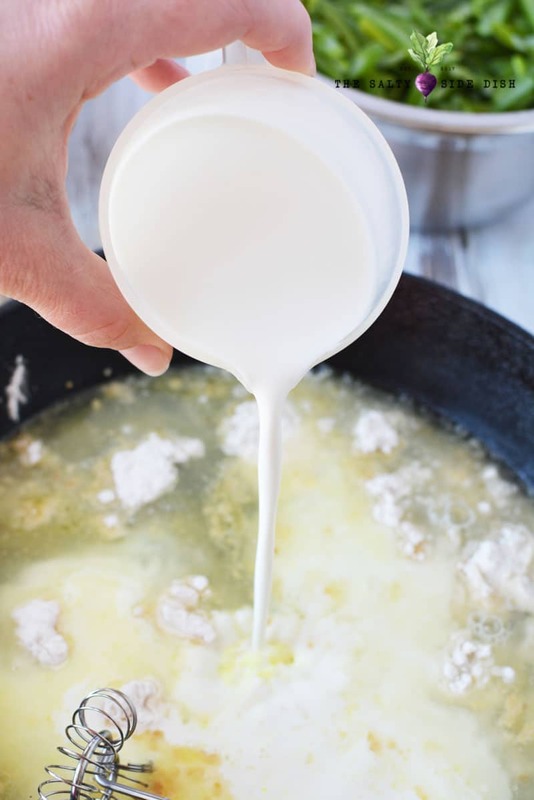 Add butter and garlic in a skillet and heat on medium until butter is melted. Stir in flour, chicken broth, half and half, salt and pepper. Cook on medium heat, whisking frequently. Continue to whisk as mixture gets bubbly and begins to thicken. Remove from heat and stir in mushrooms, 1/2 cup French fried onions and green beans. Pour green bean mixture into prepared pan and spread evenly. Sprinkle with remaining french fried onions. Bake for 15-20 minutes or until bubbly and heated through. Preheat oven to 400 and grease a casserole dish. Set aside. Add butter and garlic in a skillet and heat on medium until butter is melted. Stir in flour, chicken broth, half and half, salt and pepper. Cook on medium heat, whisking frequently. 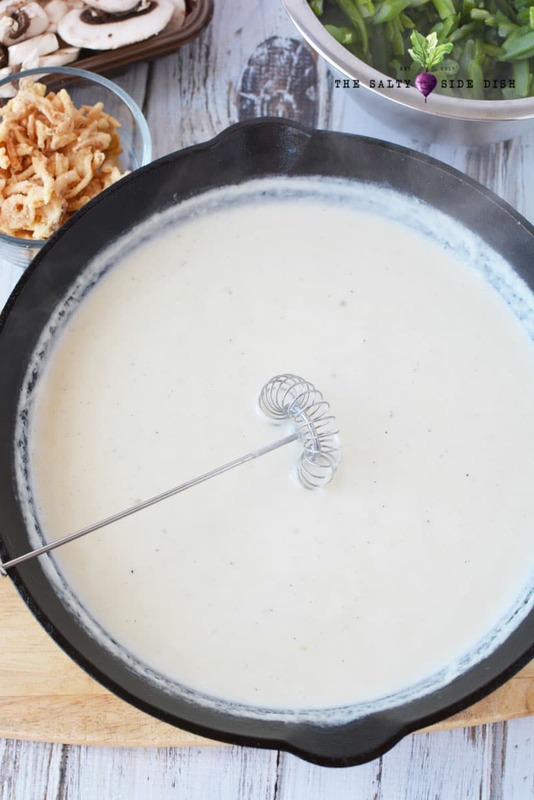 Continue to whisk as mixture gets bubbly and begins to thicken. 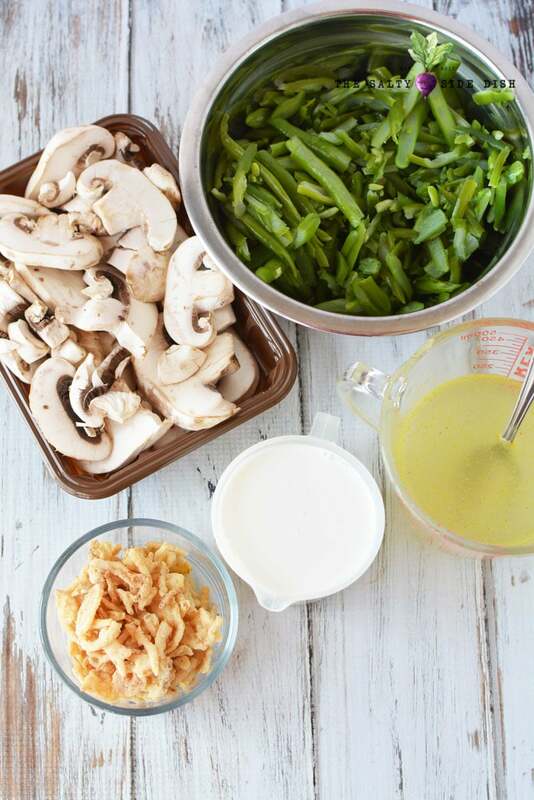 Remove from heat and stir in mushrooms, 1/2 cup French fried onions and green beans. Mix well. Pour green bean mixture into prepared pan and spread evenly. Sprinkle with remaining french friend onions. Bake for 15-20 minutes or until bubbly and heated through. Let set for 5 minutes before serving. Browse all my side dish recipes!